February 1, 2018 (La Grange, IL) - Q-BBQ, a fast-casual Michelin Guide's Bib Gourmand-winning restaurant, says eat more Omega-3* with their Corona battered cod sandwich and fish tacos available just in time during Lent at all locations from February 14 through March 31, 2018. Q-BBQ Corona Battered Cod Sandwich ($9.99) includes one small side and two hush puppies. Cod is tossed with their signature rub served on a fluffy brioche bun, and topped with pickles, red onion, lettuce, tomato and homemade Tartar sauce. Q-BBQ Corona Battered Fish Tacos ($7.99) includes three fish tacos tossed with their signature rub topped with shredded red cabbage and a creamy cilantro lime sauce. Guests may purchase one fish taco for $2.99. Fish tacos can also be mixed and matched with their Pork Belly Burnt End taco with ancho roasted pineapple topped with pico de gallo, Burnt End taco with a chimichurri sauce and topped with slaw, and BBQ Pulled Chicken taco with Memphis sweet sauce, ancho chili seasoning and pico de gallo. From left to right: For a limited time only Q-BBQ’s light and flaky Corona Battered Fish Tacos and Cod Sandwich. *Research shows that omega-3 fatty acids reduce inflammation and may help lower risk of chronic diseases such as heart disease, cancer, and arthritis. Omega-3 fatty acids are important for cognitive functioning and help with memory and performance. 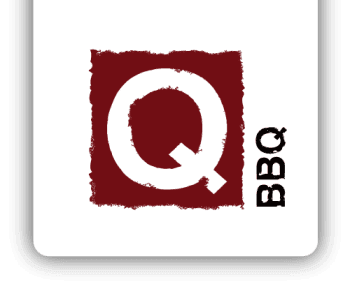 Q-BBQ specializes in authentic BBQ traditions from Memphis, the Carolinas, Texas, and Kansas City, and has added its own signature style to create a familiar yet surprising menu that is both contemporary as well as true to the legacy of "America's original comfort food." The menu features BBQ delicacies like brisket burnt ends, traditional dry rubbed chicken wings, homemade sides made fresh daily, Hush Puppies, and signature sauces such as Memphis Sweet, Texas Spicy, and North Carolina Vinegar. Additionally, Q-BBQ specializes in off-site catering.